Between 1989 and 1997 BMW sold only 7,000 of the shark nose E31 8-series in North America, a luxury grand tourer meant not to just supersede the E24 6-series, but to also eclipse it in performance, price and prestige. It was available in base configuration with a V8, but real ballers splurged for the V12, something your Porschephile neighbor couldn't get in his 928. Today buying an 850i is similar to finding a good used circus lion. They are cheap, your friends will want to come over to see it, it will drink lots of fuel and someday it will bite your head off. 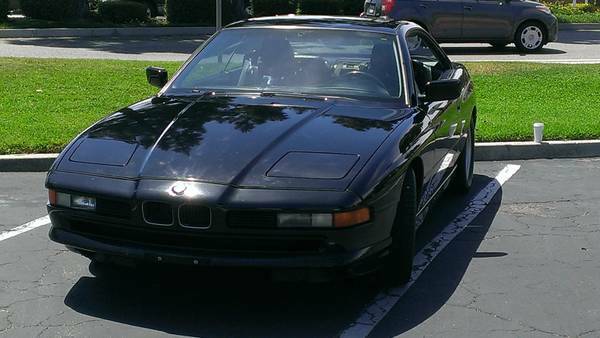 Find this 1991 BMW 850i 6-spd for sale in SF Bay Area, CA for $9850 via craigslist. Tip from Eric R.
An 850i won't literally turn you into a Roywich but it can cripple your bank account with significant repair bills if you don't feed it carefully. The seller of this one claims at the usual "intimidating maintenance items" have been done, but a careful and thorough PPI is always in order with an 850. This one is equipped with the 6-speed manual transmission, making it immensely more fun to drive than the slushbox version. The M70B50 is a 5.0 liter V12 that puts out 295 horsepower via a novel and prone-to-fail dual drive-by-wire ECU setup...which is rumored to be closer to twin inline-6 controllers than a single V12 controller. Diagnosis of problems is like a being a doctor trying to treat conjoined twins. "buying an 850i today is similar to finding a good used circus lion. They are cheap, your friends will want to come over to see it, it will drink lots of fuel and someday it will bite your head off"
However, with nothing to muffle the engine but the resonator, they are worth the trouble, just for that great noise. 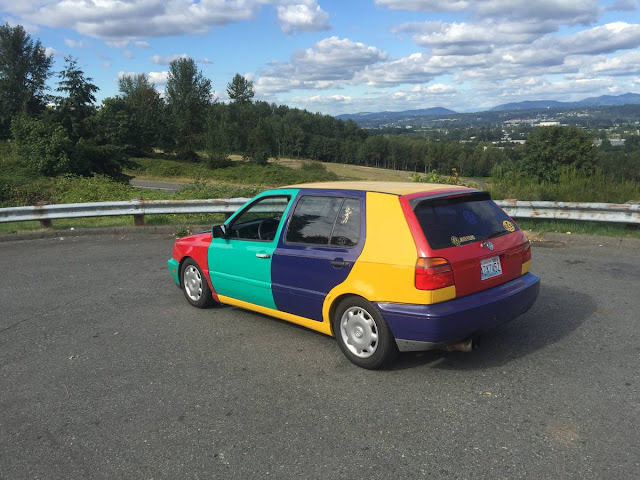 This is the type of car one hopes a friend buys so that you can drive it without having to worry about the cost. Kind of like being an uncle...you get to play with the kids, get them all wound up, then leave when its time for a diaper change or bedtime!! Anyone have any comments on these 850's vs the Mercedes W215 (99-06) CL600's? The pre-'03 5.8L V12 (362hp/391ftlbs) made the Car & Driver 10/2009 issue's "Best Cars New or Used for $20,000" list, albeit with lion bite cautions. The '03-'06 5.5L dual turbo (493hp/590ftlbs) models being too dear in '09 for the $20K limit. With four years further depreciation the early non-turbo cars are often sub-$10K and the earlier turbo V12's in the teens. The Active Body Control "ABC" seems to be the most feared lion's bite on these. Intrigued by both vehicles actually. Top Gear did a comparo of the two. The Hamster bought an 850 and Clarkson a CL600. Google "Top Gear 850 vs CL600" should bring up some clips. As I remember it, the CL fairly trumped the BMW. I honestly don't think the maintenance costs are that bad, as long as you can DIY most of it. 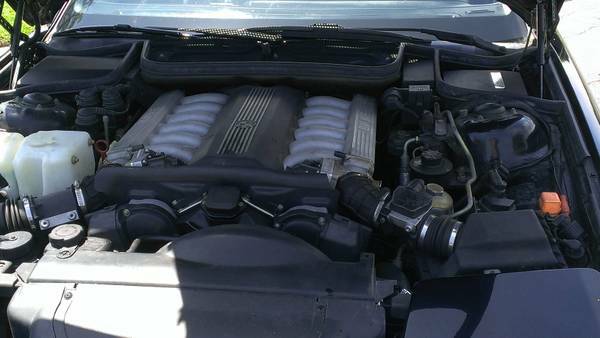 So yeah, sign me us as wanting a V12 6-speed 850i! The v12 Mercedes models were pretty bullet proof if the ABC has been maintained. The only other big expense are the coil packs and 24!! Spark plugs.